We can inspect, service, test and certify dust extraction (LEV) systems to ensure that they meet relevant COSHH requirements. Our technical engineer holds P601, P602, P603 and P604 proficiency certificates in LEV design and testing from the British Occupational Hygiene Society (BOHS). Performance reports are provided, highlighting any items requiring adjustment or replacement. 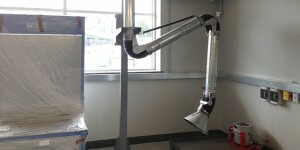 We are also qualified to advise on the design and installation of LEV for both new and existing machinery and workshops.